Learn from anywhere in the world! 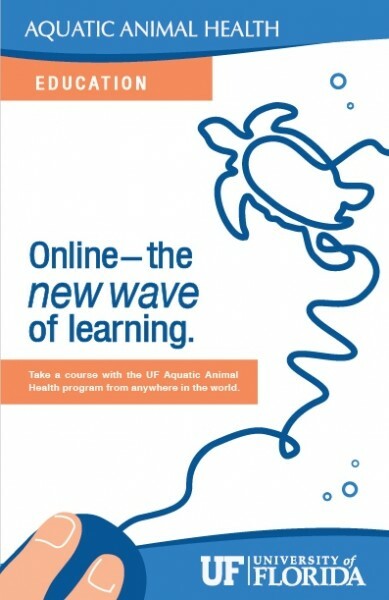 Our Distance Learning Program in Aquatic Animal Health is relatively new and new courses will continue to be added over the next several years. Most of these courses are available in slightly different formats to accomodate undergraduate, graduate, and veterinary students as well as for continuing education (CE) for veterinarians, aquarists, biologists, or post-baccalaureates interested in graduate school. Undergraduate and graduate students in our courses are often Animal Science, Fisheries & Aquatic Sciences, Marine Biology, Wildlife Ecology & Conservation, or Zoology majors. Many of the undergraduate students are on a pre-veterinary medicine track. Aquatic Wildlife Health Issues (Spring semester, annually) – is 3 credit course which introduces students (upper level undergraduate and graduate) and professionals (with an AA or higher degree) to the natural history, anatomy, physiology, behavior and common health issues of aquatic species: whales and dolphins, seals and sea lions, manatees, sea turtles and crocodilians. Manatee Health and Conservation (Summer semester, annually) – is a 3 credit course that provides students (upper level undergraduate and graduate) and professionals (with an AA or higher degree) a detailed overview of manatee natural history, health assessment, and research findings as well as explore conservation issues. Diseases of Warmwater Fish (Summer semester, annually) – is a 3 credit course designed to provide instruction (graduate and professional level) in the methodology of diagnosis, treatment and management of parasitic, bacterial, viral, nutritional, and environmental diseases of warmwater food fish and aquarium species. Students will be provided basic instruction in fish biology and general husbandry, aquatic systems and water quality management, identification and interpretation of infections agents impacting fish health, development of responsible and effective treatment plans, and consideration of biosecurity, quarantine and regulatory issues relevant to fish health. Aquatic Animal Conservation Issues (Fall semester, annually) – is a 3 credit course that will expose students (upper level undergraduate and graduate) and professionals (with an AA or higher degree) to some of the controversial issues surrounding aquatic animal species ranging from invertebrates to marine mammals, with emphasis on marine mammals, but also including sea turtles, fisheries, and marine ecosystems. Fish and Aquatic Invertebrate Histology (Spring semester, annually) – is a 3 credit course that teaches basic interpretation of the normal histology (fixed tissue microanatomy and physiology) of fish, bivalves, and corals and introduces common histopathologic (disease) findings at the graduate student and professional level. Introduction to Aquaculture (Spring semester, annually) – is an introductory course designed to provide an overview of the field of aquaculture and the common groups cultured in the United States. It is designed for undergraduate and graduate students who want a foundation in aquaculture principles to (1) apply towards more advanced coursework in aquaculture or other aquatic sciences or (2) to prepare for graduate research or a career in aquaculture. New courses that should be offered soon include Aquatic Animal Rehabilitation, Introduction to Fish Health Management, and Impact of Diseases on Wildlife Populations. You may also want to review our Frequently Asked Questions (FAQ) page or fill out our Contact Us form for more information about our distance learning program.